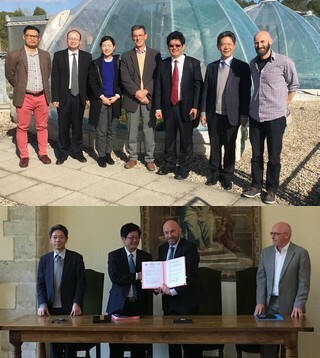 Review of the visit of the Chinese Academy of Agricultural Sciences (CAAS) to Montpellier (04-07 March 2019): signing of a cooperation agreement Agropolis International organised, from 04 to 07 March 2019, the hosting of a delegation from the Chinese Academy of Agricultural Sciences (CAAS) to strengthen and develop the partnership with the Montpellier scientific community. Based in Beijing and created in 1957, CAAS has more than 6,000 researchers, scientists and technicians and many renowned academics focusing mainly on science and technology for the agricultural sector and rural development in China. It is developing a very active international policy, particularly towards African countries. On this occasion, CAAS management was able to discuss with the CGIAR and the 4/1000 Initiative, visit several units of the scientific community and their structures (UMR AGAP, UMR Eco & Sols, UMR AIDA, UMR Ecotron platform, large greenhouse in Lavalette campus), discuss with CIRAD management and sign a framework agreement with the I-Site Muse. - sharing scientific resources and/or equipment: facilities for research, education and information purposes. To support the development of the partnership between I-Site MUSE and CAAS, the framework agreement provides for the installation of a laboratory without CAAS walls in Montpellier hosted and supported by Agropolis International. An original international collaboration mechanism with Montpellier's research and teaching institutions, and also at the European level. Laboratories without walls already involve teams from major foreign institutions such as Inta (Argentina), Embrapa (Brazil) and UPM (Malaysia).